Incredible waterfall sculpture. This is one of the most peaceful Oriental water fountains for Feng Shui and relaxation that we design. 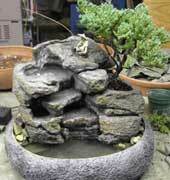 The bonsai is self watering and the fisherman sits tranquil upon his rock fishing the day away. How about some underwater lighting and fogging effects? This indoor fountain will be delivered to your door within 2 to 3 weeks. Click here https://www.youtube.com/watch?v=Vl3lbAxuvxk to view this fountain on YouTube.